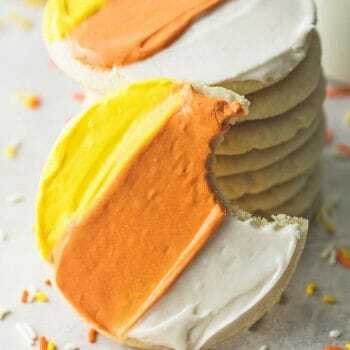 These ultra soft candy corn sugar cookies are a breeze to make and have the absolute best texture and flavor. The perfect fun and festive Fall treat! We are getting into the holiday season and I’m not one bit sad about it because I am beyond ready to push up my sleeves and start baking ALL the holiday treats. My kiddos are now just barely two years old and they are completely obsessed with helping me in the kitchen. Every day they say “help cookin! help cookin!” over and over until I sit them on the kitchen counter and let them help me fix dinner or dessert. They get especially excited when we make cookies! Cookies are just so kid-friendly, it’s the first thing I ever remember baking with my mother when I was little. I loved when she would let me stir in the chocolate chips, or add sprinkles to the frosting. Even though I love baking just on my own, I enjoy watching my kids get involved more than anything else these days. My little boy is particularly enthralled with cooking and baking and asks to “pour it” whenever a recipe calls for milk. I have to keep a close eye on him because he’s still so darn little, but he does a pretty great job of making sure it all gets into the bowl and he is so proud afterwards. It makes my mama heart melt to see him getting involved in something I enjoy, and I really like showing him how one of his favorite things – milk! – can be incorporated into so many recipes, even sweet treats! Milk is the foundation for so many of our favorite recipes, whether we’re baking, braising or mixing in batter. Plus, pairing sweet treats (like these cookies!) with farm fresh, real dairy milk isn’t just a yummy snack – it’s an easy way to help make sure my kids are getting nutrients they need to grow up strong. These ULTRA SOFT sugar cookies simply melt in your mouth and have the best texture and flavor. Even people who typically don’t care for sugar cookies fall in love with these babies. This week the kids and I took a few plates of these cookies to our neighbors and everyone raved about the taste, and how adorable and festive they are. 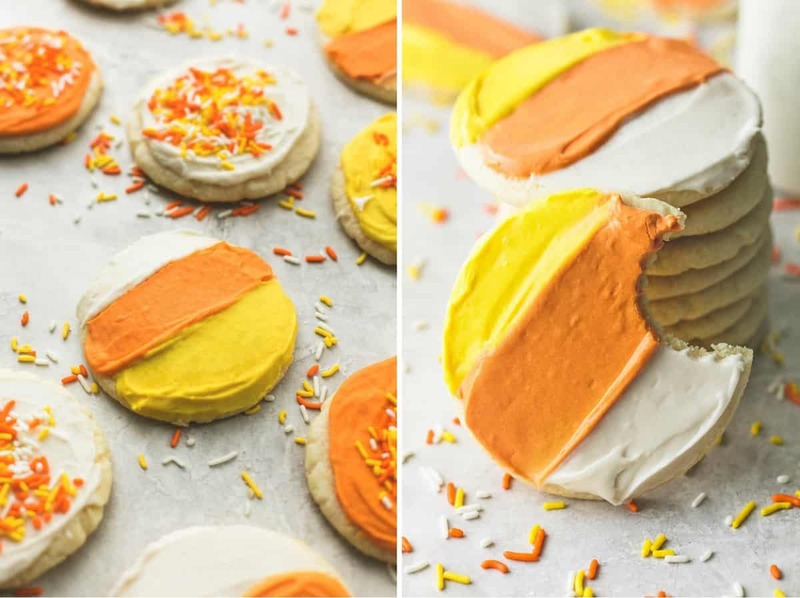 It seems like actual candy corn is a love-it or hate-it holiday confection for most people, but regardless of how you feel about the candy, these candy corn look-alike cookies will have you swooning. Pair a cookie with an 8-ounce glass of milk and enjoy! 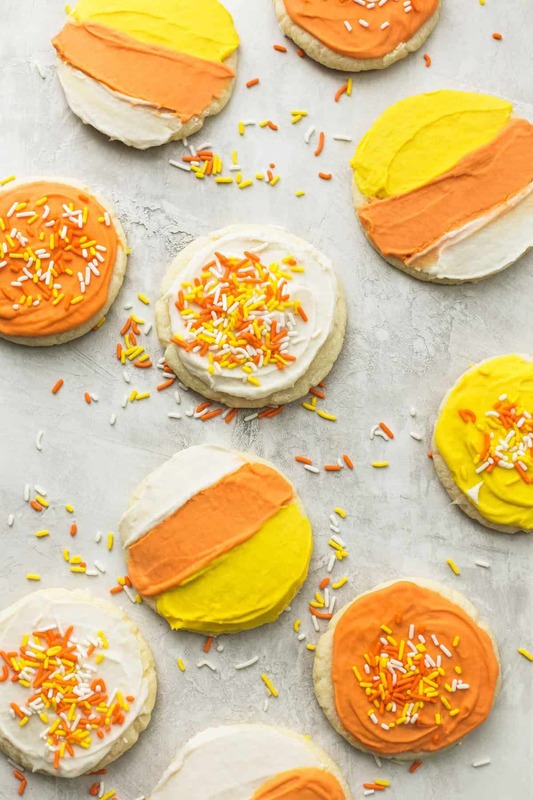 These ultra soft candy corn sugar cookies are a breeze to make and have the absolute best texture and flavor. So fun and festive for Fall! In a large bowl, cream together butter, vegetable oil, 1 1/4 cups sugar, powdered sugar, milk, and eggs. Place remaining 1/4 cup sugar in a shallow dish. Press the bottom of a tall drinking glass into the cookie dough in the bowl (just to moisten the bottom of the glass, no cookie dough should stick to it), then dip into sugar. Press the bottom of the glass into the top of each cookie dough ball to flatten about halfway. Bake in preheated oven for 8-11 minutes until cookies look dry but not browned. Allow to cool on baking sheet for 4-5 minutes, then transfer to a cooling rack to cool completely. Repeat process with remaining cookie dough. To make the frosting, melt butter in a medium sauce pan. When butter is melted, continue to whisk over medium heat until butter turns from yellow to a golden color. Remove from heat. In a medium bowl cream together butter, cream cheese, powdered sugar, vanilla, and milk until smooth and spreadable. Divide the frosting between three bowls. Whisk yellow food coloring into one bowl, and red and yellow into a second bowl to make orange frosting. 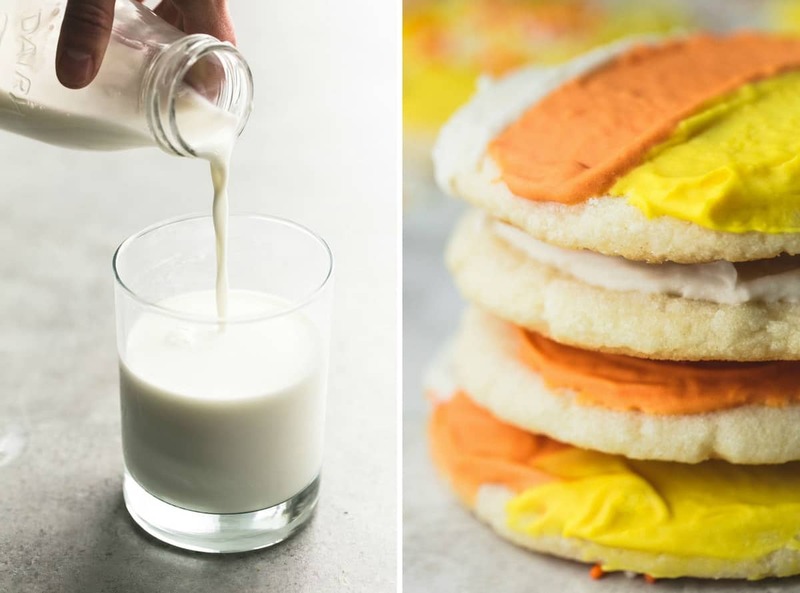 Spread white frosting on 1/3 of one cookie, followed by orange and yellow frosting to cover the cookie. Repeat with remaining cookies, serve with an 8-ounce glass of milk. Be sure to follow Milk Life on Twitter, Facebook, Pinterest, and Instagram for more delicious recipe ideas! 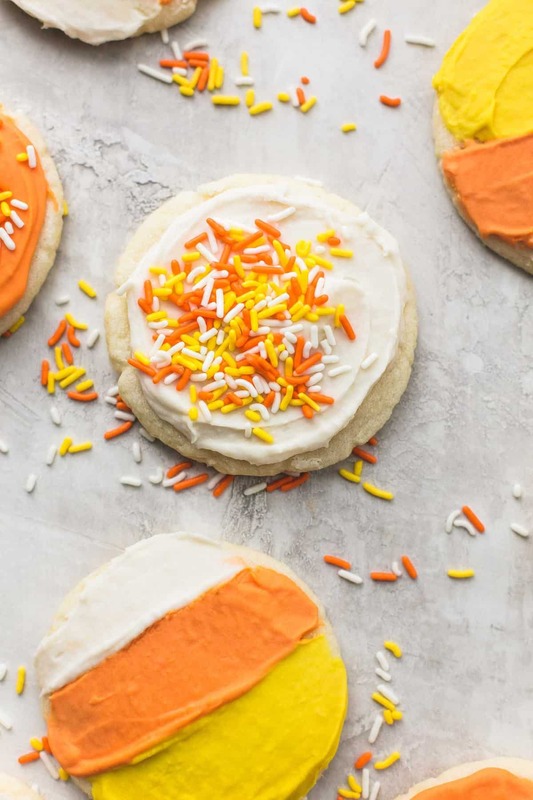 More Sugar Cookie ideas you'll love! Mmmm, I can tell by just looking at the photos that these cookies truly are “melt in your mouth”. I think that’s essential to a truly blissful sugar cookie! I really like the addition of almond extract too, I’ve never tried that in my sugar cookies before, but I definitely will now. Loving the festive Halloween touch too! I can imagine this would be a fantastic recipe for a Halloween kids party. Will definitely have to try! How do these work as roll out/cut out cookies?